The story of day 1 is here. I had promised Paul and Bobby that Day 2 would be flatter and easier. I was wrong! (Sorry Gentlemen.) 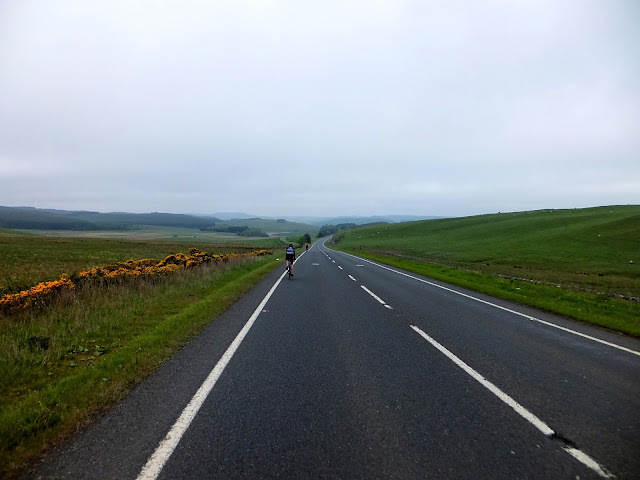 We left Hawick after a leisurely breakfast and immediately started the longest largest climb of the day. I took the front and tapped out what I thought was a manageable pace, Bobby and Paul kept with me easily and we climbed together – but eventually, as the ascent failed to relent, I pulled to one side and dropped back. That was when we began to come to pieces and we spread along the road as we climbed. Riding a mutual pace wasn’t possible any longer and by the time we reached the top, Bobby’s knee was starting to grieve him. We dropped to cross Ale Water at Ashkirk before climbing once again and finally dropping down to Selkirk. The early mist had helped keep us cool as we climbed along the A7, but it was clearing quickly as we reached Selkirk and crossed Ettrick Water. 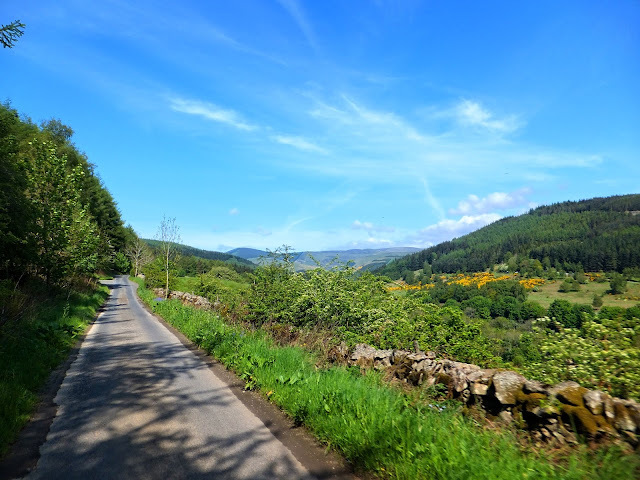 I expected us to head west now, and misjudged my gps guidance again but only for a moment before we figured it out and continued along the A707 northbound, through beautiful pine forests alongside the river. Scotland, the Lake District and Wales have so much in common for beautiful valley riding. We crossed the River Tweed and now began our westerly ride towards Moscow. Bobby was concerned about his knee enough to want us to leave him, which neither Paul and I wanted to do but we had to respect his choice. 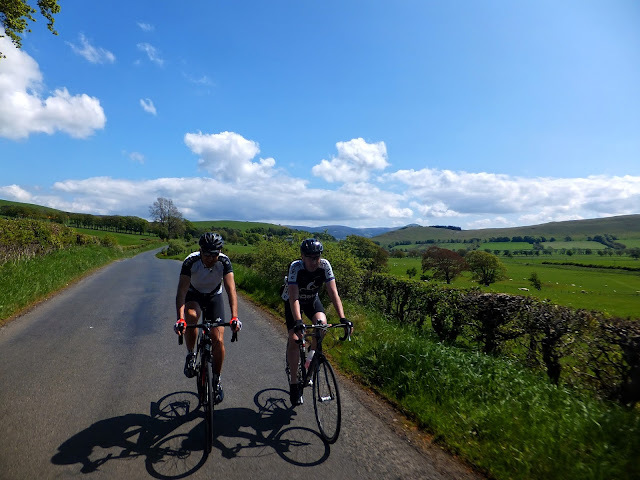 Despite this, we actually rode together for another few miles of Tweedale. When we reached the turning for Peel, this was where Bobby made the choice to take the ‘low road’, while we took the ‘high road’. There was little traffic on the A707, so following it to Peebles would be fine. 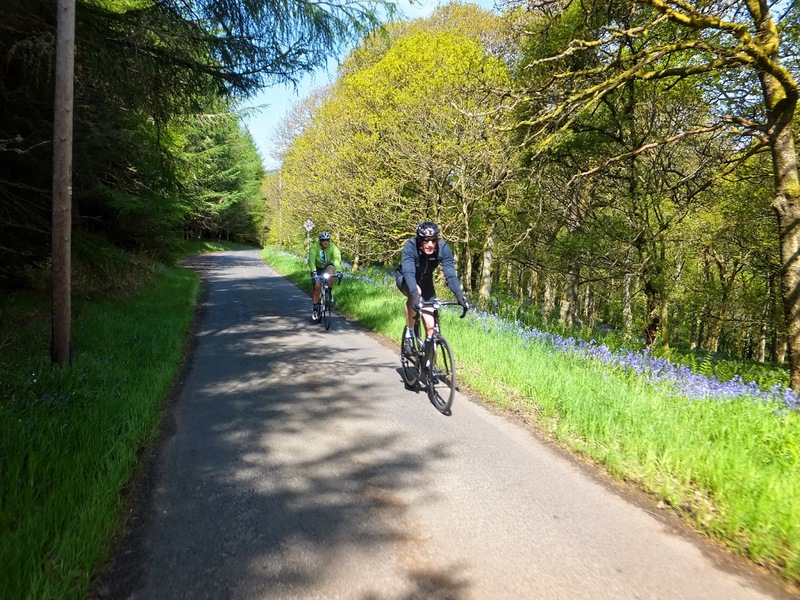 Paul and I were travelling about the same distance on the opposite side of the River Tweed, along single-track roads through the Elibank and Traquair Forest. We saw dozens of cyclists on this section of National Cycle Network. 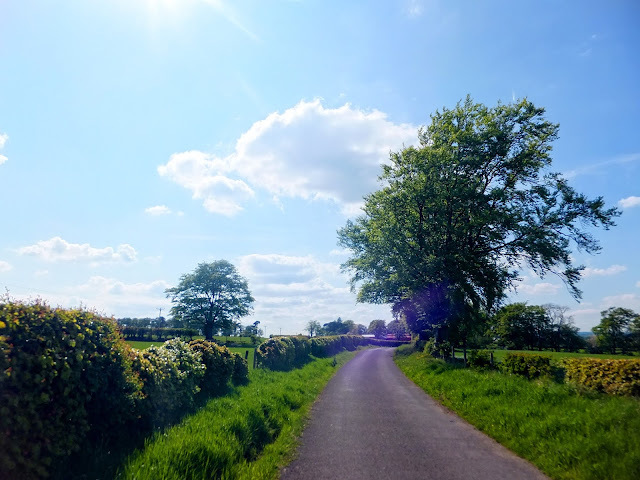 We rolled up and down this beautiful lane and the miles just melted away; the Tweed valley views were gorgeous in-between the forests of pine that were carpeted with bluebells. We could see the main road below us on the opposite side of the valley, and I spotted Scooterists buzzing along. I thought it was our friends, but there was a rally in Kelso and as a result there were actually hundreds of Scooterists out and about. Paul and I were glad to be riding in the peace and quiet on this side of the river, well away from the smokey blue two-stroke engine oil and hornet’s buzz of the engines. 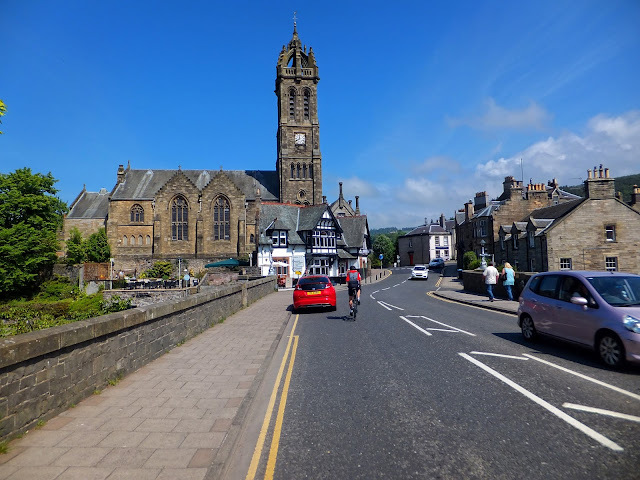 Paul and I arrived in Peebles and met up with Kay and Bobby on the steps of the church. Kay had provided a wonderful picnic spread for us all, plenty of water and snacks as well as some delicious muffins that her friend had baked that morning. The sun was beating down on us now and Kay had plenty of good sunscreen lotion for us too. Paul and I headed off while Bobby treated his knee pain with anti-inflammatory painkillers. There was more climbing ahead as we reached the top of Tweedale, passing Stobo and taking the steep little lane onto the slopes of Trahenna Hill and down to Broughton for lunch. There is the cell of a St Llolan, a 7th century Bishop here which was rebuilt in Victorian times, there is also a visitors book in the village shop with comments dating back over a hundred years. The pies from the village shop were much more up to date and delicious though. We sat in the sunshine and fed ourselves for the next leg as Bobby and Kay caught us up. The beginning of Clydedale is fairly flat and I speculated that it would be all downhill from here. Not strictly true though as no sooner had I said it, than we hit a 10% climb. 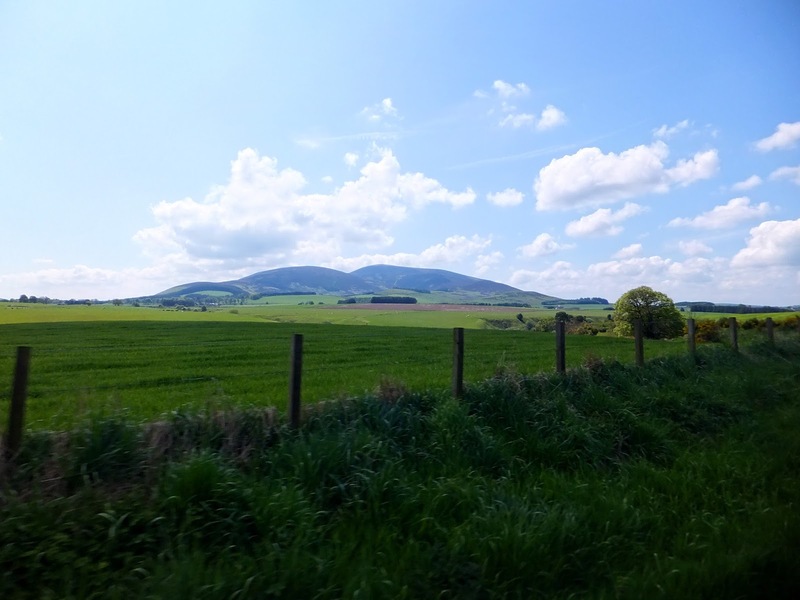 We were now circling around the 711m high, Tinto hill. The multicoloured dots spread up its side were walkers; as it is a very popular climb in Lanarkshire. We had a brief ride along the A72 and watched open mouthed at some of the utterly stupid driving. One particularly bad example involved the driver of a white car overtaking others cars while overtaking a bus, at speeds well in excess of 70mph. We were delighted to turn off, even though we had a 100m climb to Crossridge Farm ahead. We then enjoyed isolated country lanes to reach Lesmahagow and stop for another cup of coffee and some cake. There was no denying that Paul and I were enjoying a touring holiday, he never broke into a sweat and I was getting regular doses of fuel. We also met Kay one more time to top up water bottles before the final leg of the day for us. The last section of our ride, to Moscow, was primarily on empty lanes, but every now and again the gps would beep as we missed a turn. This was starting to get funny because each turn we missed was onto an even narrower and more isolated lane. At one point we didn’t even notice the turning we’d missed. But these lanes were all perfectly surfaced and a delight to ride on. Eventually we reached the A71, with no alternative routes towards Galston other than the cyclepath somewhere south of us. We just got our heads down and powered along the main road before taking the turn to Moscow. The sign said 2.5 miles – and the road went up. Up and up, all the way to Moscow’s city limits. The sun had been shining all day, and I was starting to get a significant reddening to the backs of my legs despite the sunscreen lotion. We turned around and hared downhill back to the A71 and then kept the pace up to Kilmarnock and our overnight stop at the Travelodge on the outskirts of town. As a place to stop it was really quite good. The lovely lady on reception washed our cycling clothes, and we could keep our bikes in our rooms. A short taxi ride away was the welcome of another ‘Spoons and more burgers and beer! Bobby rode the whole thing too – just behind us. Given how much his knee was hurting he achieved a very significant ride. We’d covered 190 miles and climbed over 3,100m. The vast majority of this ride was on traffic free roads, cycling side-by-side. The weather was perfect and there were no midges on this May Bank Holiday weekend. I would heartily recommend this route and if anyone wants a copy it is on RideWithGPS or I could send a link. 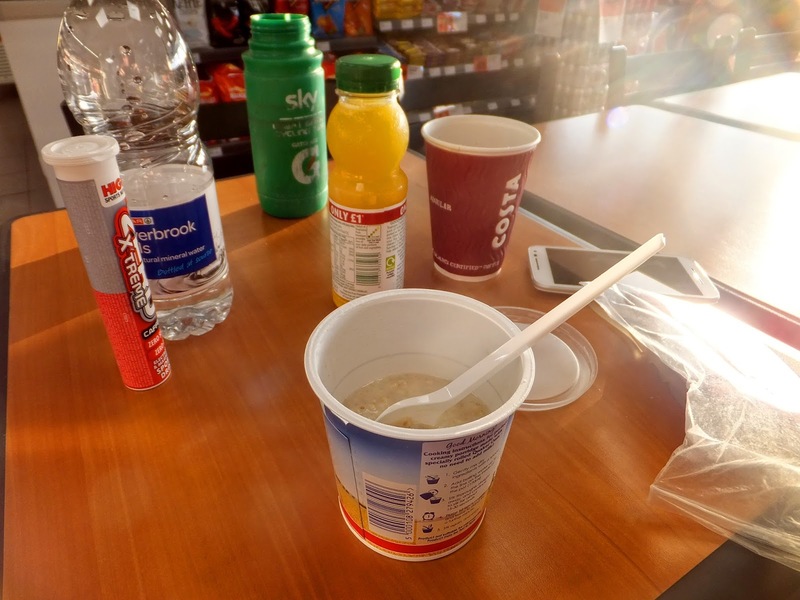 After a good night’s sleep – all Paul and I had to do was grab some food and cycle to Edinburgh for a train. 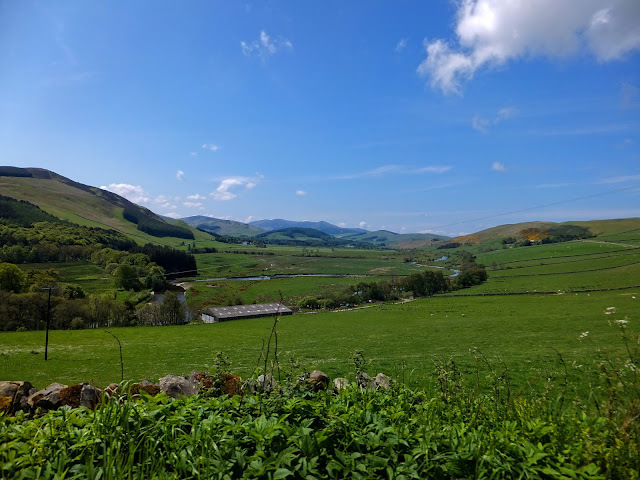 A 6am start and this time Kay wasn’t around to carry our luggage, so fully loaded we navigated our way haphazardly north and east until we found the A89, which we just bashed along to Edinburgh. 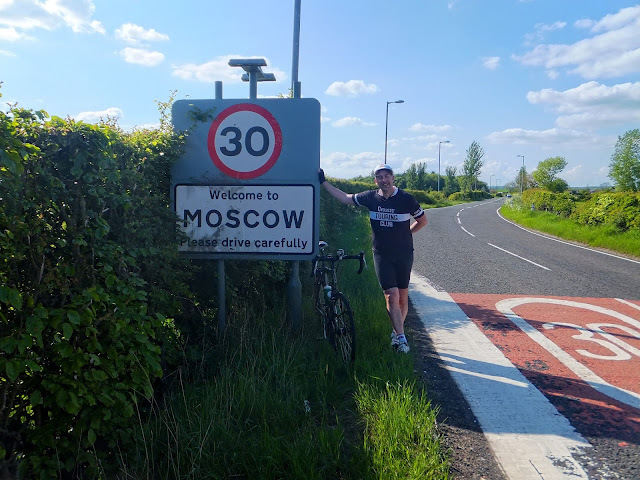 A totally different experience to the Washington to Moscow ride, but the reward on reaching Edinburgh? To cycle down Princes Street, without buses, cars or trams, with the road lined with crowds and the sound of bagpipes being played. It felt like the whole of Edinburgh had turned out to cheer us to the end of our three days cycling. Awesome!